It all started in Turin in the early 50s, when Pietro Mollo, then a twenty years old, car and HGV mechanic and himself a great motor-cycle enthusiast, had a profitable sideline servicing motor cycles and scooters, his speciality was repairing silencers. Encouraged by his father, he decided to set up his own business, and in 1954 he established SITO, and began to produce silencers for Vespa, Lambretta and Guzzino in a small garage. In 1962, shortage of space prompted to move to Monticello d'Alba, to the site which SITO now occupies, in two sheds of 1.000 sq.m. SITO's success in the european market followed the evolution of the motor-cycle sector: Vespa and Lambretta scooters in the 60s, motor cycles in the 70s, super-bikes in the 70s - 80s. Today the SITO site covers an area of 80.000 sq.m., 20.000 of which is enclosed, and the company has over a hundred employees. Its production capacity exceeds 600.000 units per year, and through its national and international sales networks, made up of the best qualified spare parts dealers, it shifts about 3.000 systems every day. The EVO-marked GPstyle exhaust of the LeVince SBK range provides the best combination of quality, performance and price for those who want to customize their bikes quickly and without major modifications while staying in full compliance with Highway code regulations. The design is based un LeoVince's ongoing experience with the leading teams and technicians of the top world GP class. 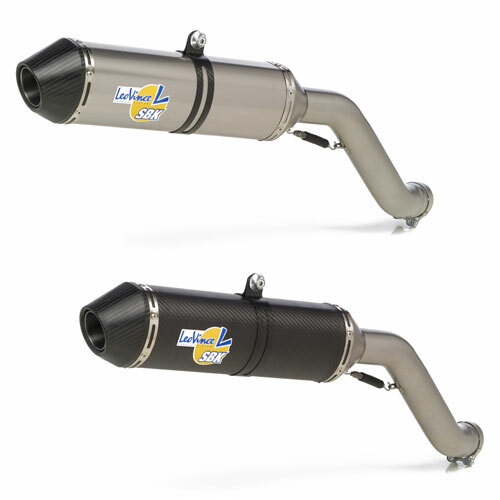 Both the silencer and the connectors are made of TIG-welded AISI 304 steel, sandblasted with stainless steel particles and are secured to the frame with a carbon fibre bracket. 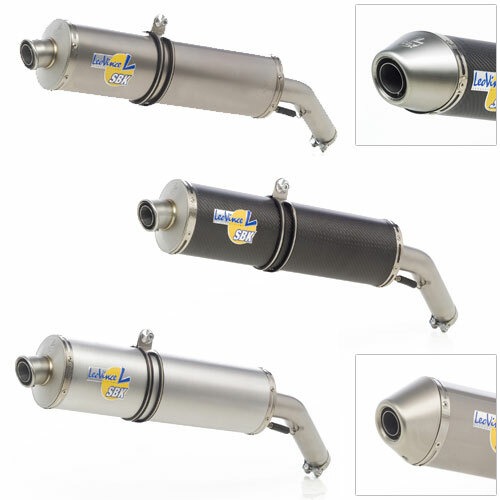 Each silencer has been specifically developed for each individual engine model to achieve a significant increase in qorque and maximum power rating, while still complying with European standards (97/24/CE dated 17th June 1997). The EVO II E-Approved GPPRO cans of the LeoVince SBK range are the result of ongoing experience and technology developed through years of competitive racing, and the need to meet day to day road circulation requirements. Silencer in stainless steel AISI 304 and variable volume, composed of 9 cones manually welded TIG. Before being welded, each single cone is sand blasted with stainless steel sand, obtaining "Titanium Look" effect. Bracket in carbon fibre. Link pipe in stainless steel AISI 304 welded TIG. E-approved (97/24/CE del 17 Giugno 1997). Emotion and reason: that is style and technology. Together with a winning and courageous choice of strategy. A strategy which LeoVince intends to use to accompany its customers from the first scooter to the heights of the motor biking sector; with a series of products, that in line with their intended use, all have the same visual impact and make use of the same materials. This is the overriding concept behind the new range of SBK GPPRO cans that have been developed for the super-sports 4-stroke range. range are the result of ongoing experience and technology developed through years of competitive racing, and the need to meet day to day road circulation requirements. They represent the best in terms of personality, performance and quality whilst fully respecting the Highway Code. They are available in both high and standard mount versions, the header pipes being made of TIG-welded stainless steel AISI 304. The silencer is completely made of titanium with a choice of carbon or titanium skinning. The attachment brackets are of carbon steel. 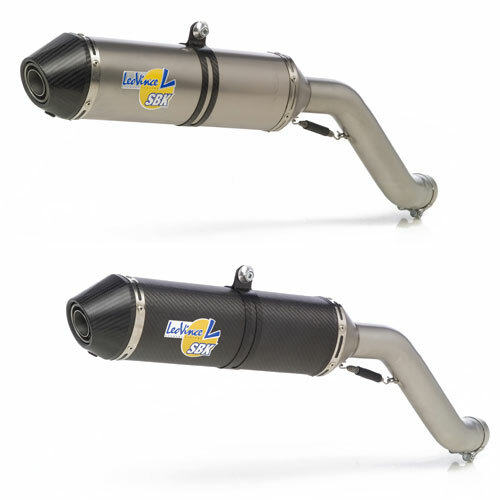 The format of the silencer is tailored according to the specific engine model to ensure efficient boosting of the torque and maximum power rating whilst complying with European standards (97/24/CE dated 17th June 1997). are the result of the experience acquired through years of world class racing, together with ongoing laboratory testing using all the latest equipment. The result is a truly top class product in terms of material, finish and performance. The product is available in two configurations: low or high mount. The header pipes are made of TIG-welded AISI 304 stainless steel. 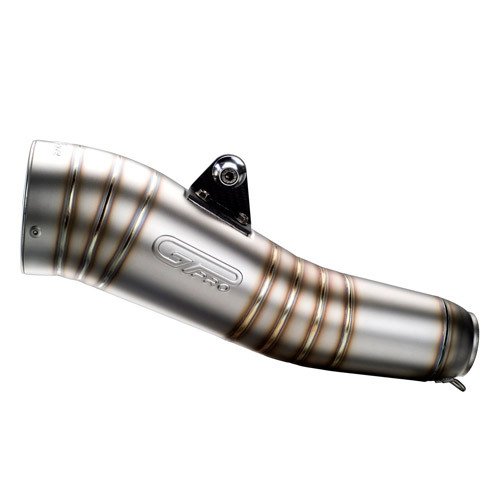 The silencer is fully made of titanium with a choice of carbon or titanium skin. The straps, or the frame fixture brackets where applicable, are made of carbon. 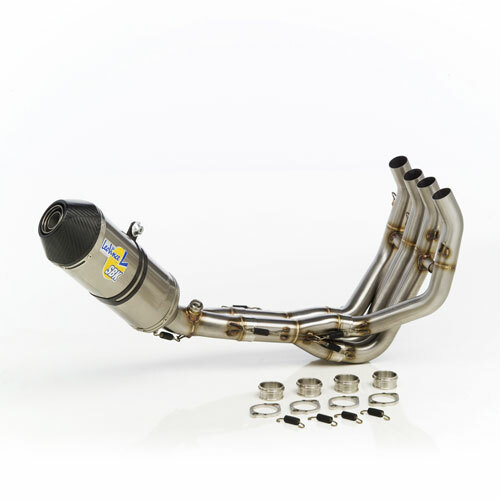 The format of both the header pipes and silencer is tailored according to the specific engine model in order to boost the torque and maximum power rating. range ensure the best quality, performance and price ratio for those who want to customize their bikes fast, simply and with the minimum of modifications. 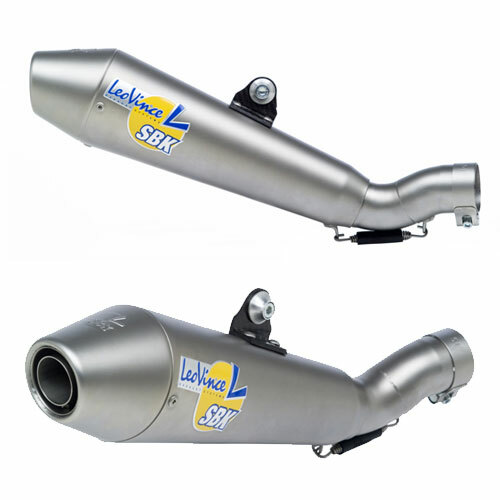 They are available in two versions: “Slip-on” and “Bolt-on”; in the first case the silencer is joined to the standard system by means of a joining pipe, while in the second case the silencer is fitted with a machined- from- solid aluminium pipe, that can be directly connected to the original header pipes. The “Slip-ons” are available with either standard or high crossing. The silencing body and the connectors are made of TIG-welded steel AISI 304. The outer casing is available in either carbon or titanium. The straps and the frame attachment brackets where applicable, are made of carbon. The format of each silencer is tailored according to the specific engine model to ensure efficient boosting of the torque and maximum power rating. range ensure the best quality, performance and price ratio for those who wish to customize their bikes simply and fast, and in full accordance with the Highway code regulations. They are available in both “Slip-On” and “Bolt-on” versions; in the first case the silencer is connected to the system by means of a joining pipe; while in the second case the silencer features a machined-from -solid aluminium flange, which is directly attached to the original header pipes. The “Slip-On” version is available with either standard or high mount option. The silencing body and the fittings are made of TIG-welded stainless steel AISI 304. The skinning is available in either carbon or titanium. The strips, and the frame attachment brackets where applicable, are made of carbon steel. The format of the header pipes themselves and of the silencer is tailored according to the specific engine model in order to boost the torque and maximum power rating whilst complying with European Standards (97/24/CE dated 17th June 1997). range ensure the best quality, performance and price ratio for those who wish to customize their bikes simply and fast, and with few modifications, in full compliance with Highway Code regulations. 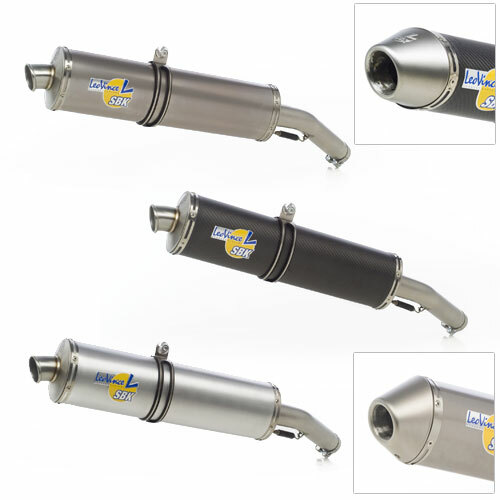 They are available in both “Slip-On” and “Bolt-on” versions; in the first case the silencer is connected to the system by means of a joining pipe; while in the second case the silencer features a machined from the solid aluminium flange, which is directly attached to the original header pipes. The “Slip-On” version is available with either standard or high mount. The silencing body and the fittings are made of TIG-welded stainless steel AISI 304. The skinning is available in either aluminium, carbon or titanium. The strips, and the frame attachment brackets where applicable, are made of aluminium alloy. The format of the header pipes and silencer is tailored according to the specific engine model in order to boost the torque and maximum power rating, whilst complying with European Standards (97/24/CE dated 17th June 1997). range ensure the best quality, performance and price ratio for those who wish to customize their bikes simply and fast, and with the minimum of modifications. They are available in both “Slip-On” and “Bolt-on” versions; in the first case the silencer is connected to the system by means of a joining pipe; while in the second case the silencer features a machined-from- solid aluminium flange, which is directly attached to the original header pipes. The “Slip-On” version is available with either standard or high mount. 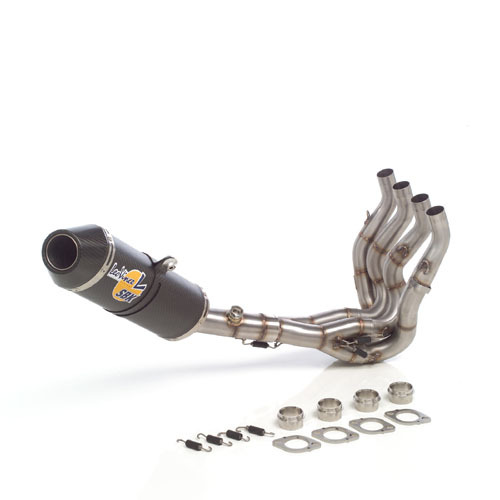 The silencing body and the fittings are made of TIG-welded stainless steel AISI 304. The skinning is available in either carbon or titanium. The strips, and the frame attachment brackets where applicable, are made of aluminium alloy. 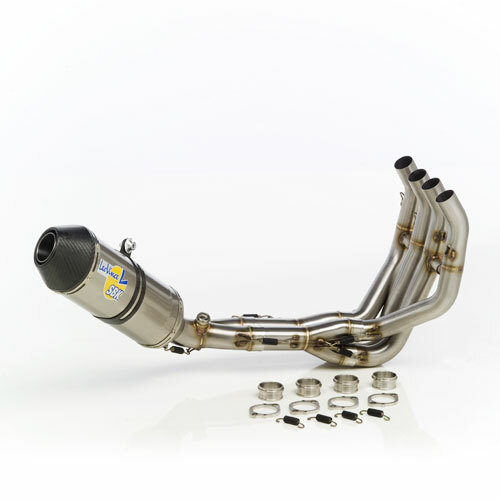 The format of the header pipes themselves and of the silencer is tailored according to the specific engine model in order to boost the torque and maximum power rating.